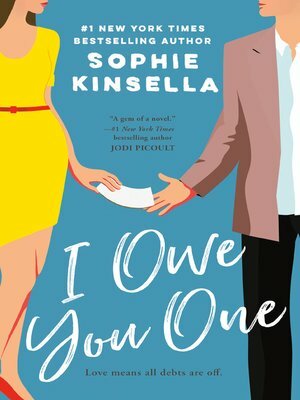 From the author of Surprise Me comes an irresistible story of love and empowerment about a young woman with a complicated family, a handsome man who might be "the one," and an IOU that changes everything. Fixie Farr has always lived by her father's motto: "Family first." And since her dad passed away, leaving his charming housewares store in the hands of his wife and children, Fixie spends all her time picking up the slack from her siblings instead of striking out on her own. The way Fixie sees it, if she doesn't take care of her father's legacy, who will? It's simply not in Fixie's nature to say no to people. So when a handsome stranger in a coffee shop asks her to watch his laptop for a moment, she not only agrees—she ends up saving it from certain disaster. To thank Fixie for her quick thinking, the computer's owner, Sebastian, an investment manager, scribbles an IOU on a coffee sleeve and attaches his business card. Fixie laughs it off—she'd never actually claim an IOU from a stranger. Would she? But then Fixie's childhood crush, Ryan, comes back into her life, and his lack of a profession pushes all of Fixie's buttons. As always, she wants nothing for herself—but she'd love Seb to give Ryan a job. No sooner has Seb agreed than the tables are turned once more and a new series of IOUs between Seb and Fixie—from small favors to life-changing moments—ensues. Soon Fixie, Ms. Fixit for everyone else, is torn between her family and the life she really wants. Does she have the courage to take a stand? Will she finally grab the life, and love, she really wants?